I got a call from the Wall Street Journal last month for a last-minute assignment to photograph Harvard geneticist George Church in his lab. 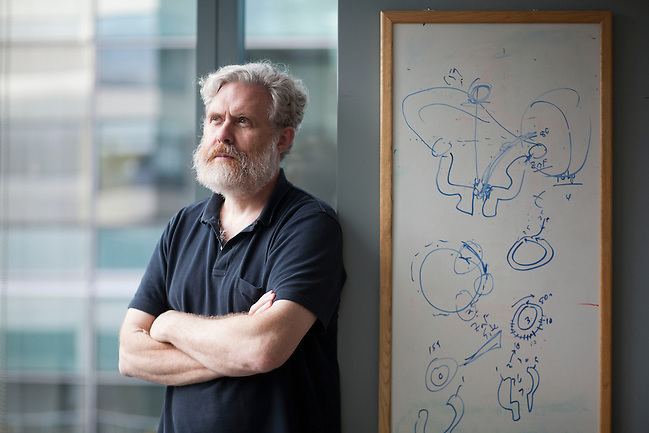 Church and his colleagues recently encoded his latest 53,000-word book into DNA — and then they made 70 billion copies of it. Keep in mind, we’re talking DNA, so those 70 billion copies of that 53,000-word book really just amounts to about a single drop in the bottom of a test tube. Colleagues are calling the development a breakthrough in data storage, though reading the data back is still a lengthy process for now. Church, as you can imagine, was quite busy that afternoon — all of this was shot while he was on mute during a conference call! That left me a bit of time to wander around the lab and hang out with the grad students doing all sorts of interesting stuff with E. Coli and DNA. Be sure to check out the whole story online (may be behind the paywall).